On a bright and sunny Sunday morning, the Choo Yilin team met with the beautiful Sherlyn Chan to unveil her custom Choo Yilin bangle. We took this time to have some tea and chat about the journey of creating a one-of-kind jewellery piece that’s designed to suit her vibrant personality and unique style. Among all of Choo Yilin's signature designs, why were you most drawn to the Peranakan Flower Trio Bangle? I wanted something classic that could stand the test of time and be easily paired with any outfit - casual or formal. This design is the perfect reflection of a Choo Yilin classic. Even though I’m not Peranakan myself, I have fallen deeply in love with this heritage. In fact, Choo Yilin's Peranakan designs were what drew me to the brand in the first place. 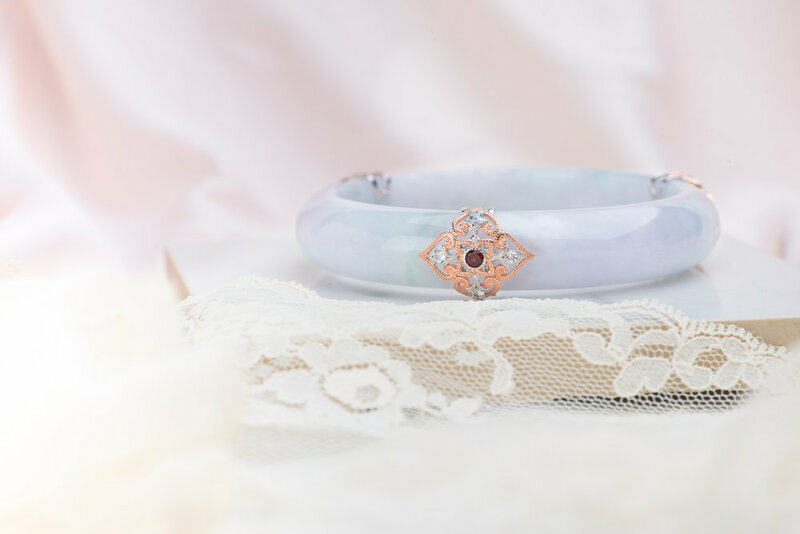 The bangle I absolutely fell in love with is a light-hued Type A Jadeite bangle with flecks of green, white and lavender. It’s one of the most beautiful things about natural jade - that different hues can be present in a single piece. I absolutely love the fact that these colours can be seen under both natural and indoor lighting; it’s like a surprise at every angle. What was the bangle customisation journey like for you? Truth be told, it was a wonderful partnership between the Choo Yilin team and I. Throughout this journey, I wasn’t alone. During the first consultation when I was choosing the design, I knew I wanted something timeless but I also didn't want colours that were too subtle. With a light jade colour, we needed gemstone colours that could provide contrast and look prominent. I also chose the metalwork to be in solid gold because I definitely want my bangle to last through the years. Usually, with bangle customisations, there’s a set list of gemstone combinations to choose from. Eventually, we went with a custom gemstone combination of Red Garnet (in the centre motif) and White Topaz (for the four corners) to be set on solid 9kt gold metalwork. I remember squealing in delight when I received a text message of an image of this combination. I was so surprised that Yilin personally took the time to advise the team on the design iterations! I really was touched that she even chose the specific hue of the Red Garnets that would look best on my bangle. I would not have gotten such a beautiful end result if not for Yilin and her capable team - I know they went above and beyond; they were as invested in the creation of my bangle as I was. My bangle exceeded more than what I had hoped for, and I can say the Choo Yilin team was unrelenting in the pursuit of perfection. They were patient and did not buckle or settle for second best. "Each bangle customisation journey takes months. From this journey, I truly understood the meaning of 'great things just take time'." How do you store and care for your bangle? I keep my bangle away from direct sunlight and store it in my cool and dry jewellery drawer. Singapore is very humid. I would not want the moisture content in the air to affect the metalwork of my bangle. Even if the metalwork is in solid gold, I still want to make sure it’s well taken care of, so whenever I put on body lotion or perfume, I make sure the products are fully absorbed into my skin before I wear my bangle. That way, moisture or chemicals from the products will not go onto it. Then, after a day of wear, I wipe down my bangle with the polishing cloth that was provided, and place it back onto my jewellery drawer. I try not to wear my bangle on occasions where I know I’ll need to move around a lot (and most definitely not for exercise or sports). I usually only wear it when I’m out for a fuss-free day of relaxation, or to formal luncheons or dinners, and of course, for those extra special occasions! What are your plans for this bangle? I do not own any family heirlooms and would love to kickstart this tradition of creating and passing down heirlooms in my family. Whenever I hear stories of girls wearing jewellery from their grandparents or great grandparents, I always feel a little envious. I find the sentiment behind heirlooms exceptionally meaningful. I have a few favourite Choo Yilin jewellery pieces apart from this bangle. I would love to keep a set of solid gold earrings, necklace, ring and bangle as family heirlooms to be passed down for generations. Just thinking about this really warms my heart! Our journey with Sherlyn has been an absolute pleasure and we’re so honoured and glad to have been a part of some very special milestones, like her beautiful wedding back in 2016. And it certainly doesn’t end here; we look forward to the wonderful moments life has yet to offer - the moments we hope to capture through precious, timeless keepsakes. Keen to know more about her journey with us? Read more about Choo Yilin X Sherlyn Chan here.